This is a very interesting and complex herbal blend. 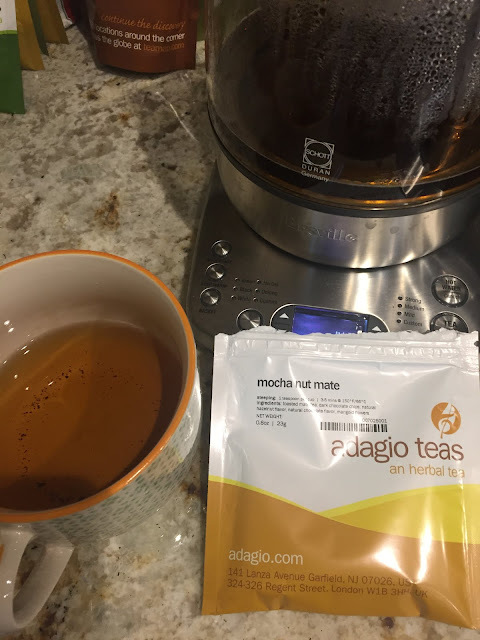 I ordered it as part of a large sample order from Adagio teas, but after lots of proper tea sampling I was sort of dreading making this. Today is going to be one of the wettest days we have seen in California, as such a good day for multiple pots of tea - so if I disliked it I had plenty of time to make another pot. Well it certainly surprised and delighted on this cold rainy day. Usually I find Yerba Mates to be very 'earthy' to the point of tasting like an artisan salad; this mix was a nice balance that distracted from the usual flavor notes of the mate and filled the mouth with a full smooth balance of flavor. This might end up replacing strait Yerba Mate in my collection as it still contains all the goodness of Yerba Mate without any of the negatives. I am unsure how many calories (or sugars) are contained in this blend with the cocoa, so that warrants investigation before re-ordering (re: keto diet).